Eeee! 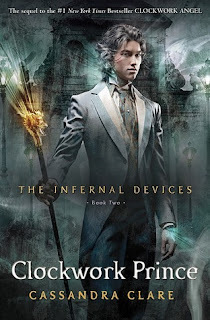 You have to forgive me while I fangirl over the cover for Cassandra Clare’s Clockwork Prince, the second book in The Infernal Devices series. It was released this morning at BEA and it features the wonderful Jem in the artwork. The doesn’t come out until December 6 of this year, but in the meantime you can read the prologue online. Between that and all the other teasers that have been sneaked, I’m dying to read it… Here is a link, by the way, to a Clockwork Angel bookmark I made recently which you can download to print at home. Plus a Mortal Instruments and Madeleine L’Engle ones, too!